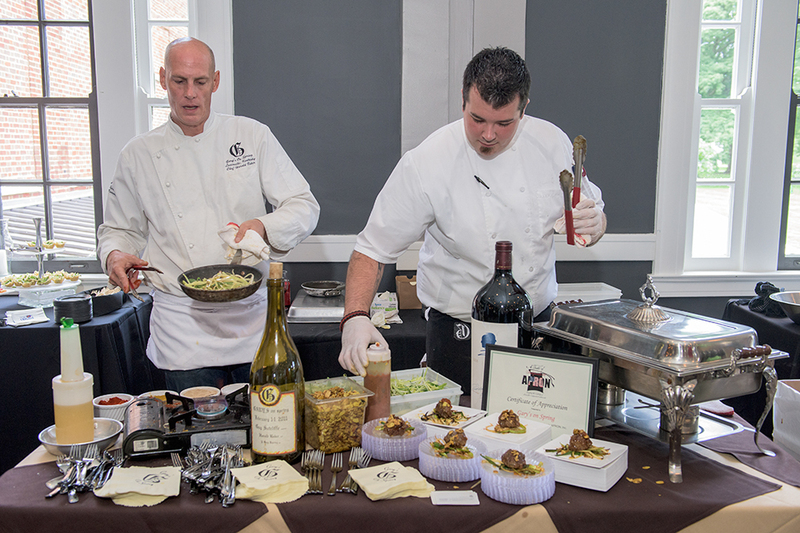 Sunday I shot the “A Taste of Independents” Apron, Inc. fundraiser at The Olmsted for The Courier-Journal. It appeared in Monday’s print edition on the Metro section cover. Normally, I don’t taste – I’m there to shoot, and it’s not easy. I’m looking for candid situations in a crowded, visually cluttered space in a limited amount of time. I don’t have hands free to carry food and drink around. But I broke my rule! I tried Varanese’s Bourbon Barrel Smoked Pork Chop Topped with Apple-Bacon Chutney. It was so good. And, I was just standing there by the table for Ward 426, so I tried their Bacon Wrapped Chorizo-stuffed Dates in a Tomato Barbecue Sauce with Judy Schad Goat Cheese. My God. I had to get out of there! On my way out, I passed Chef Dean Corbett, owner of Corbett’s and Equus & Jack’s Lounge, talking with award-winning photographer Dan Dry. They were about to part, but seeing that I was about to photograph them, it seemed that Dan paused just long enough for me to frame and shoot … Candid enough! Happy birthday to my parents, Bo and Betty – 75 years young! Jim Battles, director of the Synchopaths, performs during their set at the fifth-annual Monarch Celebration, Saturday July 18, 2015 in downtown New Albany, Ind.